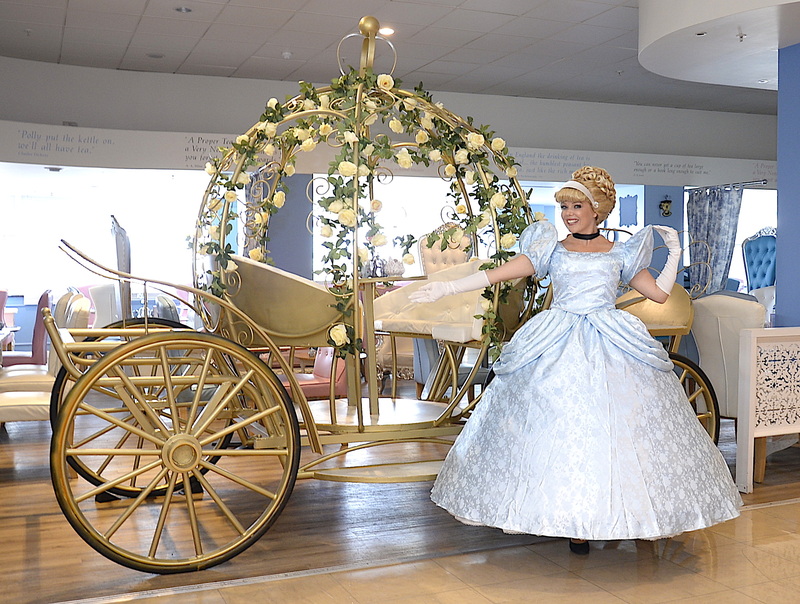 If you're here, that means you've heard about our amazing new princess-style carriages. The golden vintage carriages are currently permanently in place at our two branches in London, at House of Fraser Oxford Street and House of Fraser Victoria Street. A similar Carriage will be installed at our Guildford branch (5th floor, House of Fraser Guildford) on October 7th 2017. The Princess actress (like in the above photos) is not present with the Carriages. 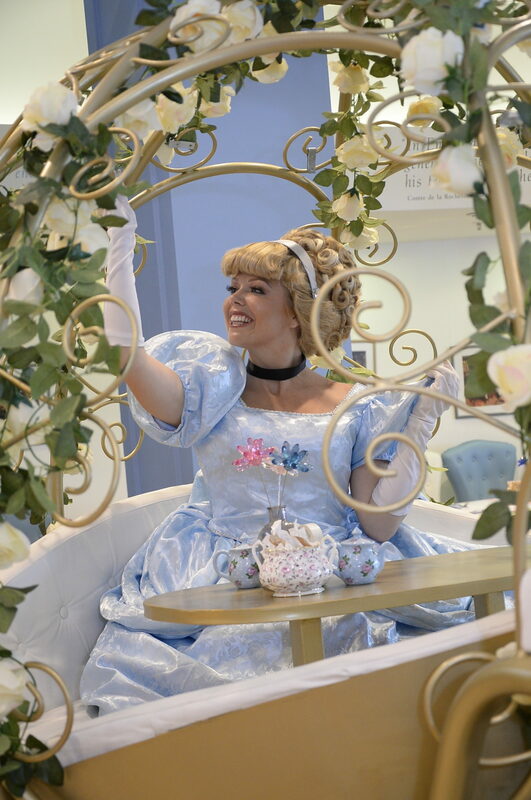 If you would like to have a princess actress join you at the time of your carriage booking, you can book an actress directly from one of the many party companies that provide this service. Email us for details. 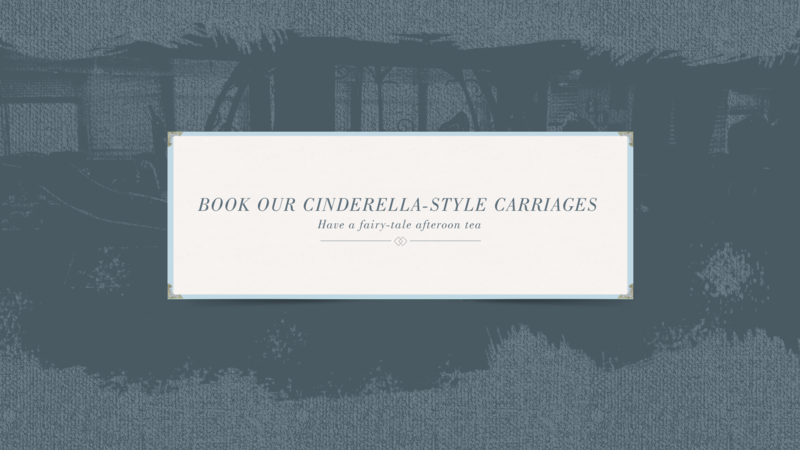 You can book the carriages by clicking on the links below. But first let us explain the terms and conditions. There is a usage fee of £12.95 per person to use the carriage. On top of that, there is a minimum spend requirement of £21 per person for adults or £10.95 for children under 12 years. The usage fee is paid in advance at the time of booking and is non-refundable in case of cancellation. The Usage Fee will NOT be deducted from your bill at the time of your visit. This means you have to pay in full for your food and drink that you order, subject of course to the minimum spend requirement of £21 per person. For the usage fee, you get use of the carriage for a one hour and 15 minute time slot. Of course after your time in the carriage is over, you are free to move to one of our normal tables. For the £21 minimum spend you can, for example, have our Traditional Afternoon Tea which costs only £21.25 per person. Or you if you want to have breakfast or lunch instead of the afternoon tea, you can order anything from our main menu as long as it totals £21 per person. For example, you can have a main course, a drink and a dessert or slice of cake. The final price will depend on what main course, dessert and drink you choose. With regards to the options of afternoon tea and main courses, you can find all prices and details in our menu. You just need to scroll down and click on the menu icon to view a PDF of the menu. You can book the carriage for two people up to six people. Four adults can sit very comfortably in the carriage. Six guests in the carriage will be OK but we have to advise you that it is a bit of a squeeze depending on the build of the people sitting in the carriage. WARNING: Children should be supervised by a parent or guardian at all times while they are in the carriage. There is a risk of serious injury if children are not properly supervised as they could fall out of the carriage and hurt themselves. The carriage is elevated off the ground so if a child falls out they could be seriously hurt. Babies and toddlers should be held by a parent/guardian at all times as the Carriages cannot accommodate a high chair due to space constraints. For the usage fee you get use of the carriage for 75 minutes, after which the carriage turns into a pumpkin. Just kidding! But there is big demand for the carriage so we ask our guests to stick to their time slots. You can book online using one of the three links below, one for our London Oxford Street branch, one for our London Victoria Street branch and one for our Guildford branch. All three branches are located at the House of Fraser department stores in these locations. When you click on one of the three links below, it will take you to the booking page where it says "Book a Carriage". Once you have booked, make sure that you complete the booking process by paying the non-refundable usage fee. If you don't pay it, the booking gets automatically cancelled after two hours. Once you have paid, you will receive an automated email with the confirmation. Please make sure you bring this along with you on the day of your visit.